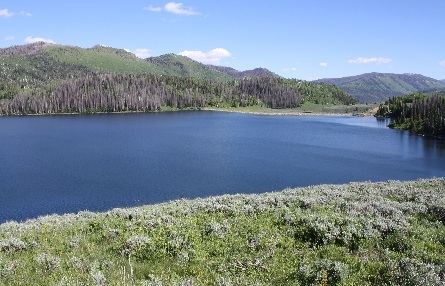 Cleveland Reservoir is located in SouthCentral Utah on the Wasatch Plateau, approximately 45 minutes west of Huntington, Utah, or 30 miles east of Fairview. It&apos;s elevation is approximately 8800 feet. Because trout overwinter well at Cleveland, the fish have a chance to grow. Two-pound rainbows are not uncommon. The Division of Wildlife Resources even receives reports of five pounders from time to time. If you like to fish from the shore, state Route 31 circles around the reservoir. The road features multiple pull-outs that provide lots of access to the shore. The north and northwest sides are especially popular because of good road access and generally good fishing success. Although a few cutthroat trout find their way into the reservoir from the inflow, Cleveland is a rainbow fishery. Consequently, all of the traditional rainbow trout baits are effective. More info. about Cleveland Reservoir in this article. Nightcrawlers and worms top the popularity list. The most common technique from shore is to fish off the bottom using a sinker, and then placing a mini-marshmallow or PowerBait under the worm so the worm floats a few inches off the bottom. The best PowerBait colors are rainbow or chartreuse. When the trout aren't taking bait, a lot of anglers throw spinners and spoons. Two of the best are the Jakes Spin-a-Lure or a Kastmaster. Gold or silver are the best colors to use. Fly fishing is often effective from spring through fall. Good patterns include the wooly bugger, soft hackle fly, leech, and prince nymph�in sizes 4-8�at the end of sinking line.